Are You a Nasty Woman or a Bad Hombre? 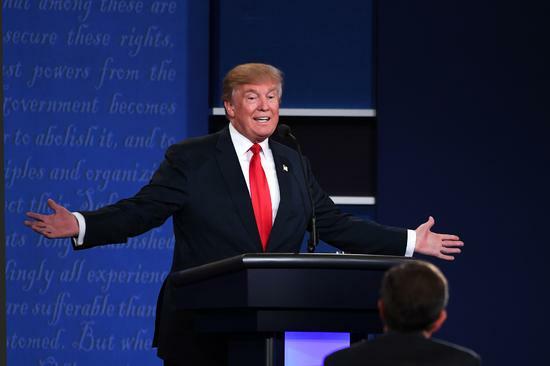 People around the United States are reacting to two expressions used by Donald Trump during the final presidential debate on Wednesday night. He called Hillary Clinton "such a nasty woman" and referred to Mexican drug dealers living in the U.S. as "bad hombres." Toward the end of the debate, Clinton said if she were elected president, she would make sure rich Americans pay their fair share of tax. "My social security payroll contribution will go up, as will Donald's, assuming he can't figure out how to get out of it," Clinton said. Trump reacted to the comment, shaking his head, raising his index finger and saying "such a nasty woman" into his microphone. Earlier in the debate, Trump was speaking about increasing security along the border between the United States and Mexico. "One of my first acts will be to get all of the drug lords, we have some bad, bad people in this country that have to go out," Trump said. "We'll get them out, secure the border, and once the border is secured, at a later date we'll make a determination as to the rest. But we have some bad hombres here and we're going to get them out." Hombre is the Spanish word for man. People following the debate had fun with the unusual phrases. Chelsea Handler is a comedian and host of a late-night television show. She posted a poll on Twitter, asking "are you a bad hombre or a nasty woman?" Over 45,000 people voted. So far, 61 percent of voters considered themselves a "nasty woman." The Reuters news agency reported that the term was used over 300,000 times overnight. Many Clinton supporters asserted that they were happy to support a "nasty woman." One Twitter user wrote: "Proud to be a nasty woman." Other people reacted to "bad hombres." Reuters reported that phrase was used over 100,000 times shortly after the debate. One Twitter user, Jose Miranda of Florida, wrote: "This badhombres is the first of his family to graduate from college, did Americorps and taught in public schools." Of all the comments related to the phrases, perhaps the one that summed up the night the best came on Twitter. One user posted a photo of bathroom doors. On the women's door it said "nasty women" and on the men's door it said "bad hombres." Families on social security benefits will be harshly affected. I fancy Leicester to go up. Now I'm not a drug dealer and I'm not a drug user. 1.We'll get them out, secure the border, and once the border is secured, at a later date we'll make a determination as to the rest. We have found some drivers clueless as to the law. 2.Of all the comments related to the phrases, perhaps the one that summed up the night the best came on Twitter. Well, to sum up, what is the message that you are trying to get across?